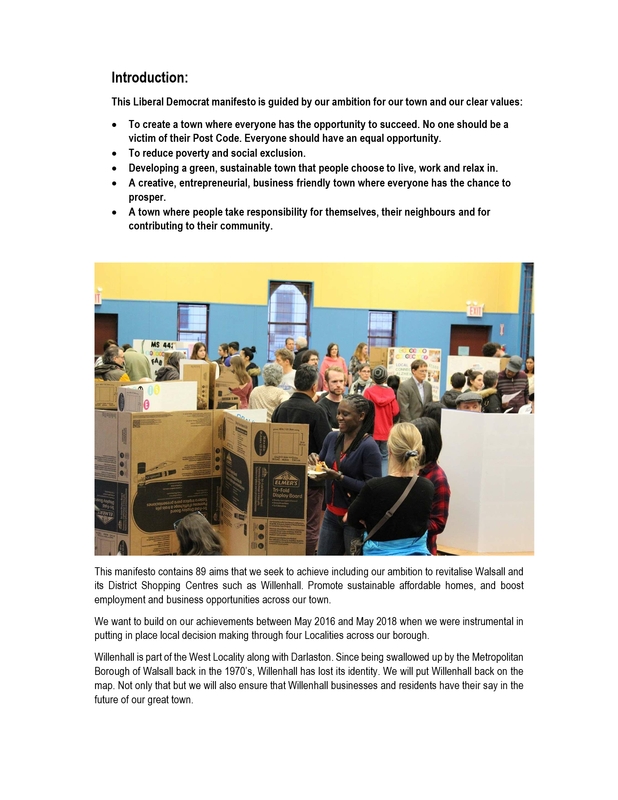 There has been a great response to our 2019 Local Election Manifesto. So much so that we felt it would be beneficial to repeat what what we said at it’s launch last month. We have also provided a link to the PDF Version and also a page by page look as part of this post. Any questions please don’t hesitate to message me. 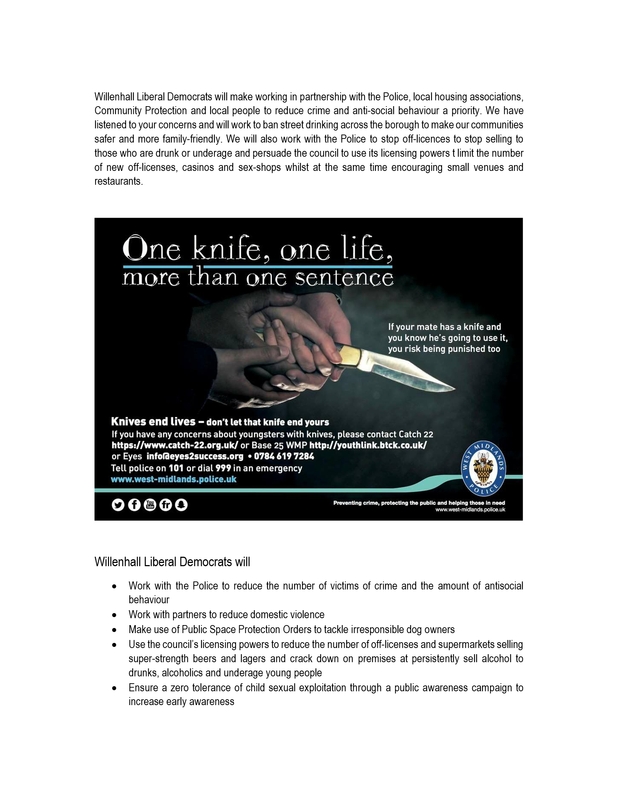 “Willenhall Lib Dems want the best for our town. 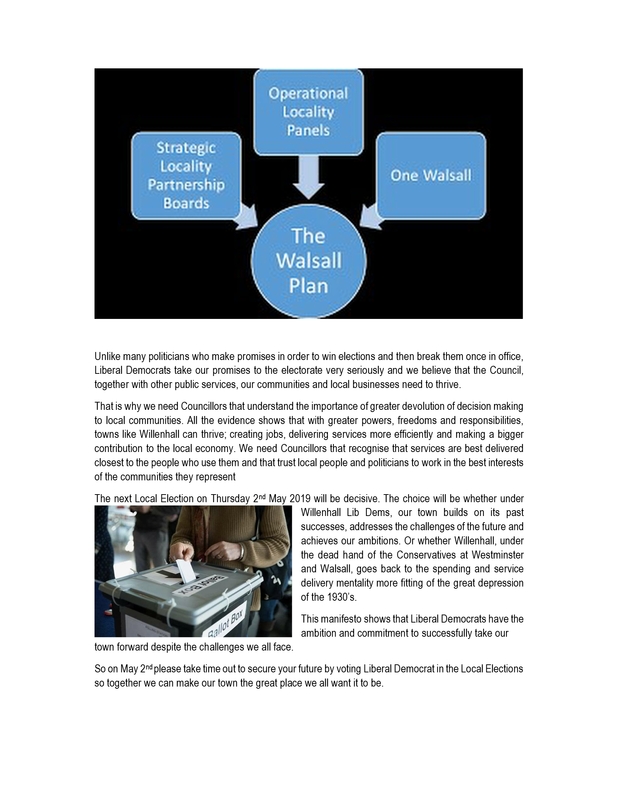 We have always spoken up for residents both on Walsall Council and at the West Midlands Combined Authority. Making sure you always get a fair share of the resources available. 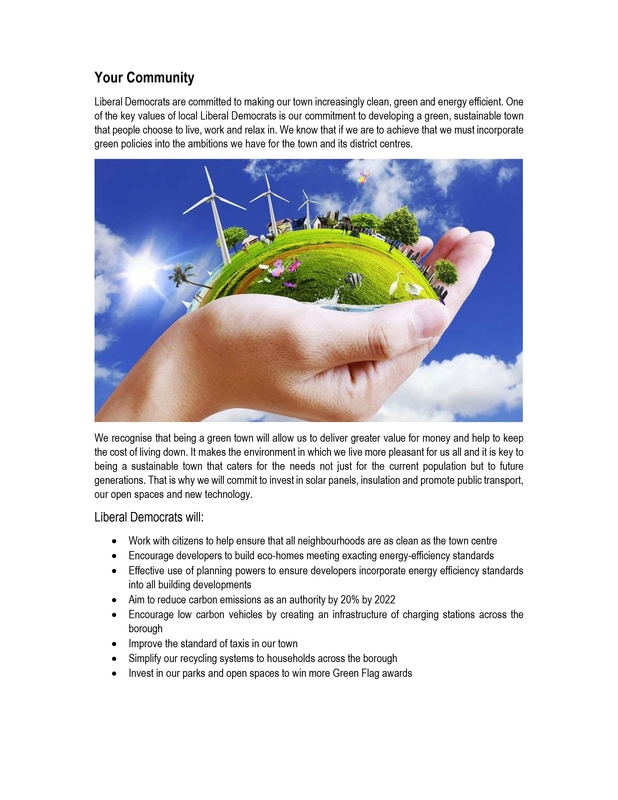 This manifesto sets out our plans to continue building on the progress already made. 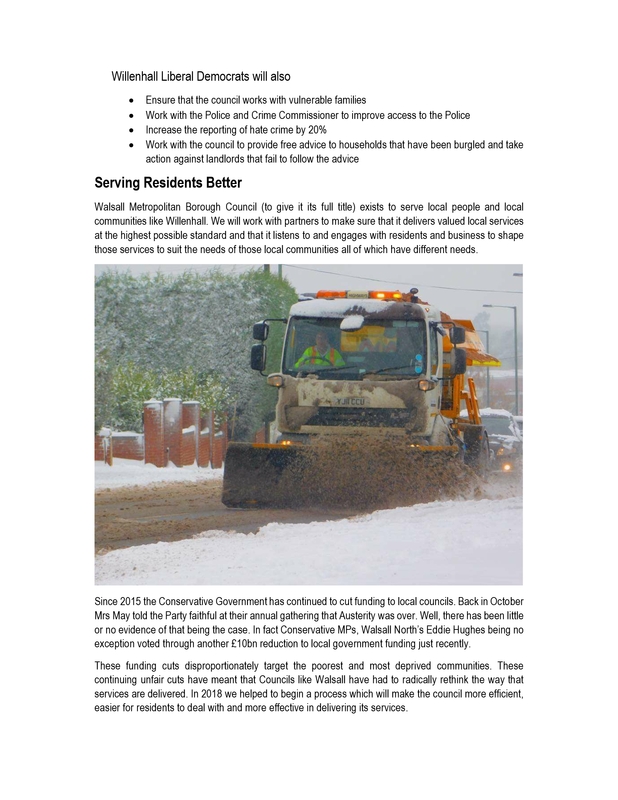 “In recent years the Conservative Government at Westminster has dramatically cut local spending, aided and abetted by Conservatives at Walsall’s Council House. Their continuing austerity measures are ideologically and politically driven and have disproportionately hit those at most risk in our communities – the elderly on fixed incomes, those with disabilities whose lives are tough enough, then there’s the children and young people who have little or no say on their own futures along with single parents and working families struggle to make ends meet. 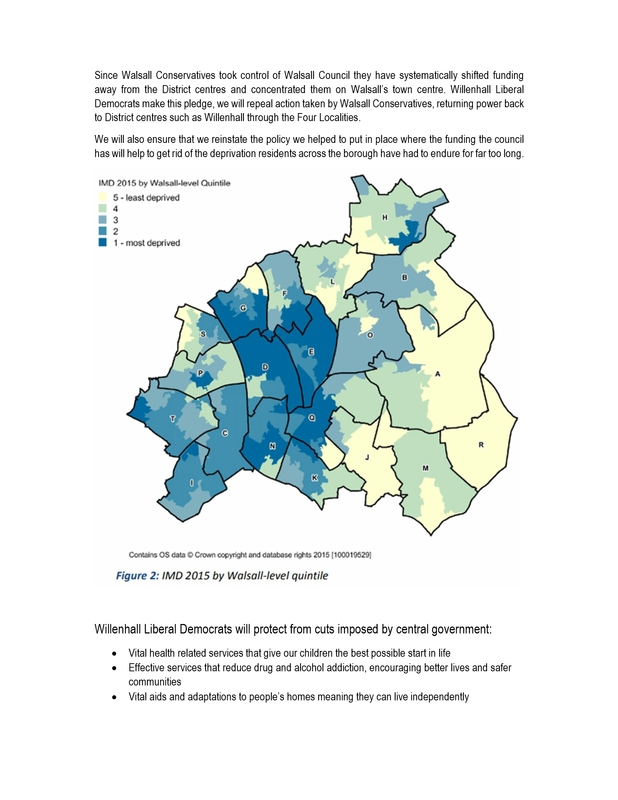 “Conservative cuts to local government funding continue to touch all our lives, even more so in urban cities and towns such as Walsall and its District Centres such as Willenhall. They do this whilst protecting the wealthy mainly Conservative-run councils in the South and South East. It’s because of these challenges that we need to have bold ambitions to continue to improve our town for the benefit of its people. “In these difficult times we need to change the way services are designed so that they deliver our goals. Now more than ever partnership working between the public, voluntary and private sector is key to success for our town. “We need more than ever to work together with local people so that we can take on more responsibility, look out for each other, respect our local environment and take the opportunities that come our way. “This is our plan, our commitment, to work together with you to make our town a town to be proud of. Ensure every child is taught in a local school judged to be good or outstanding by OFSTED. 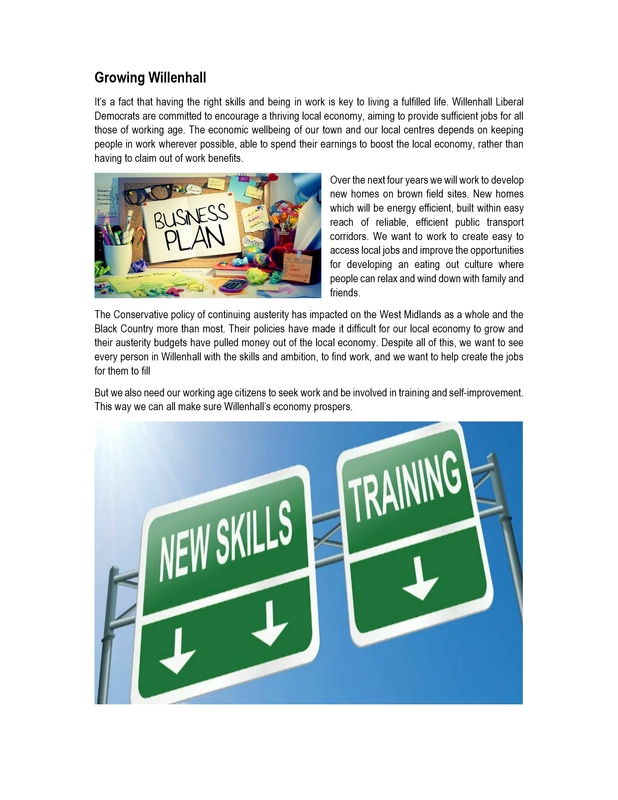 Guarantee a job, a training place or further education place for all 18-24 olds. Ensure all new homes in our town are built to 2050 standards, fit for purpose, and affordable to run whether you rent or buy. Tackle the growing problem of fuel poverty. 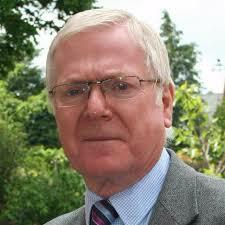 Reduce the number of victims of crime by a fifth and reduce anti–social behaviour. To create a town where everyone has the opportunity to succeed. No one should be a victim of their Post Code. Everyone should have an equal opportunity. 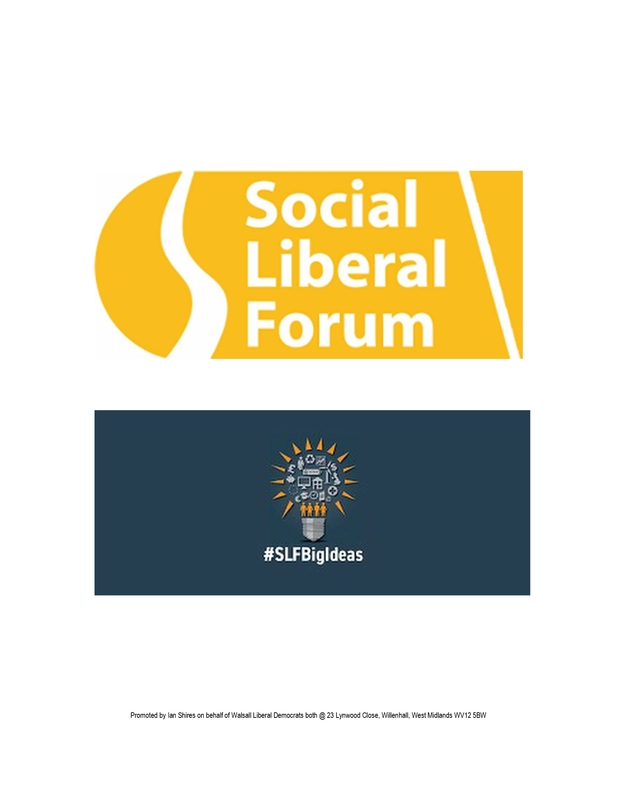 To reduce poverty and social exclusion. Developing a green, sustainable town that people choose to live, work and relax in. A creative, entrepreneurial, business friendly town where everyone has the chance to prosper. A town where people take responsibility for themselves, their neighbours and for contributing to their community. 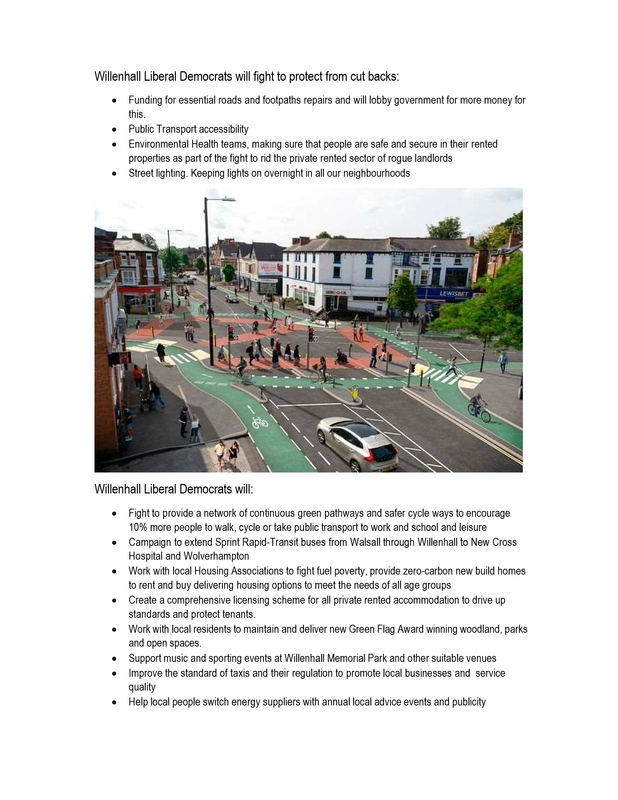 This manifesto contains 89 aims that we seek to achieve including our ambition to revitalise Walsall and its District Centres such as Willenhall. 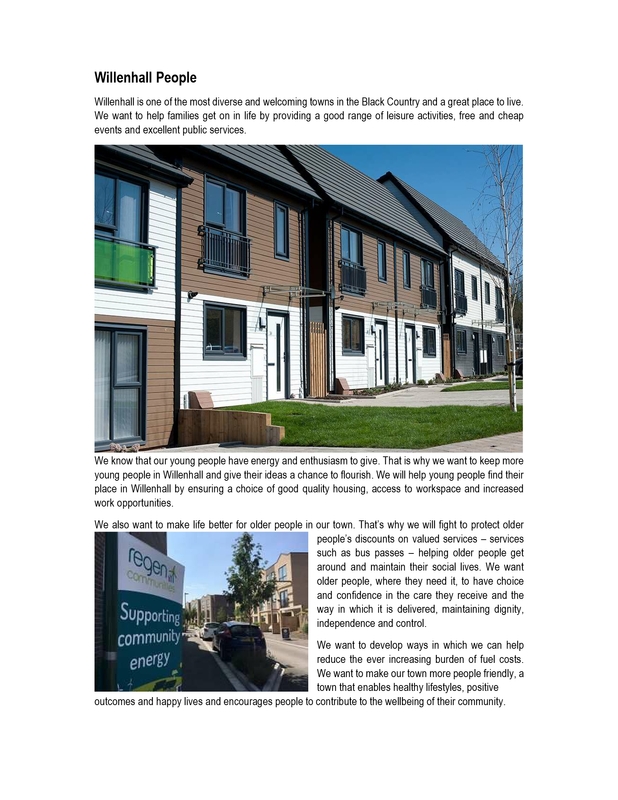 Promote sustainable affordable homes, and boost employment and business opportunities across our town. We want to build on our achievements between May 2016 and May 2018 when we were instrumental in putting in place local decision making through four Localities across our borough. Willenhall is part of the West Locality along with Darlaston. 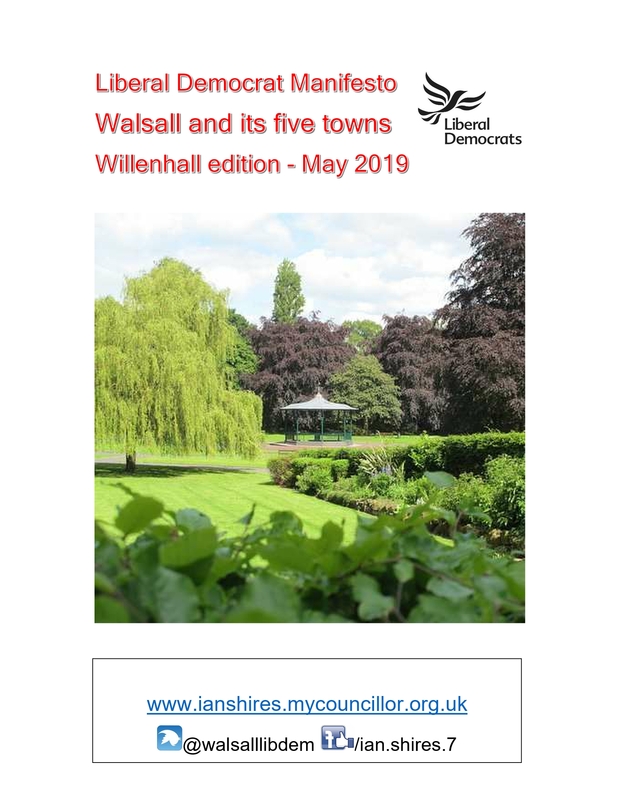 Since being swallowed up by the Metropolitan Borough of Walsall back in the 1970’s, Willenhall has lost its identity. 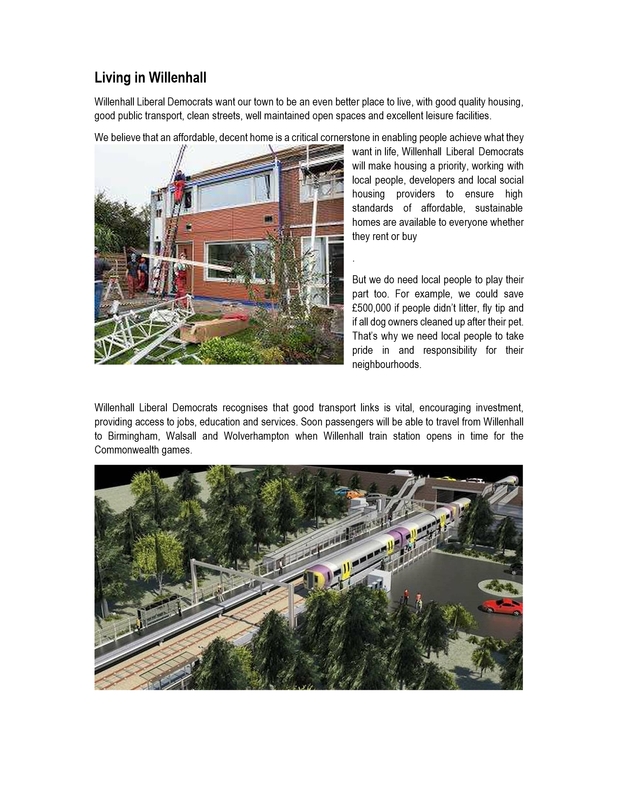 We will put Willenhall back on the map. 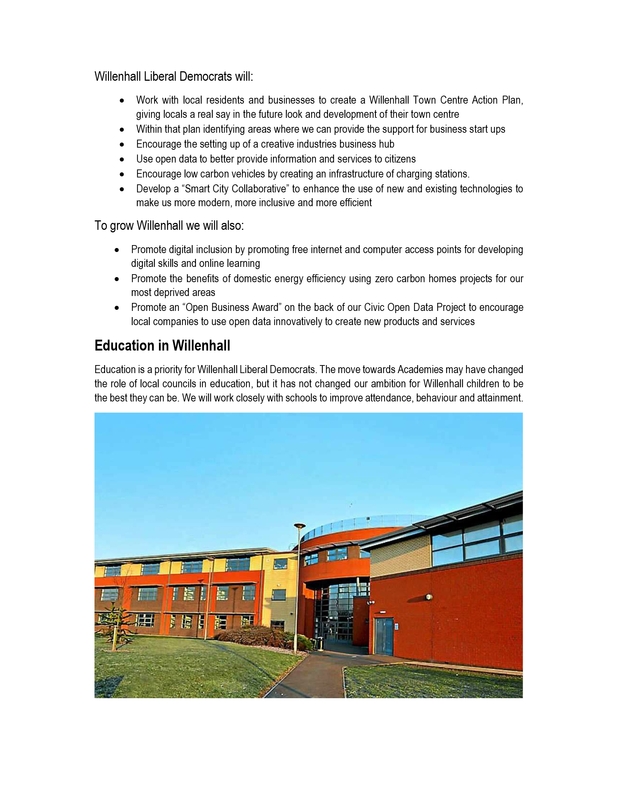 Not only that but we will also ensure that Willenhall businesses and residents have their say in the future of our great town. 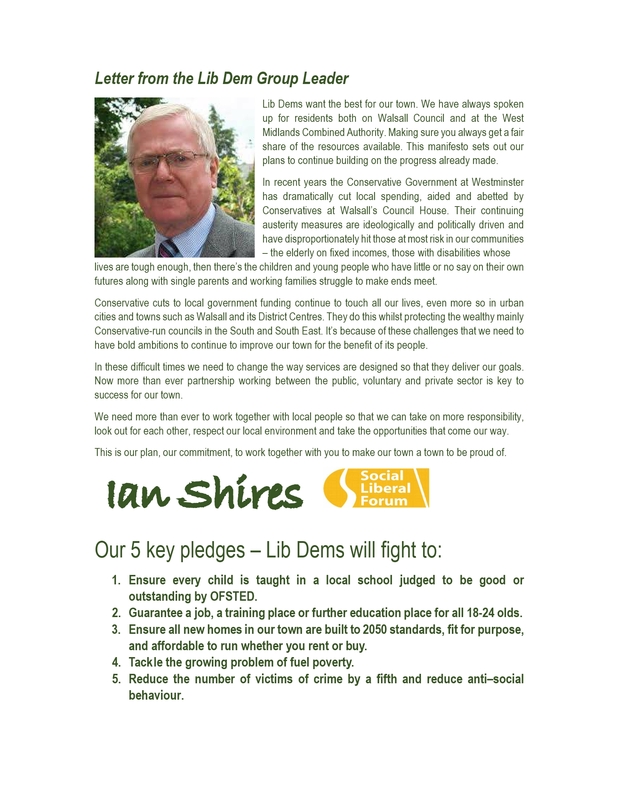 Unlike many politicians who make promises in order to win elections and then break them once in office, Liberal Democrats take our promises to the electorate very seriously and we believe that the Council, together with other public services, our communities and local businesses need to thrive. The next Local Election on Thursday 2nd May 2019 will be decisive. 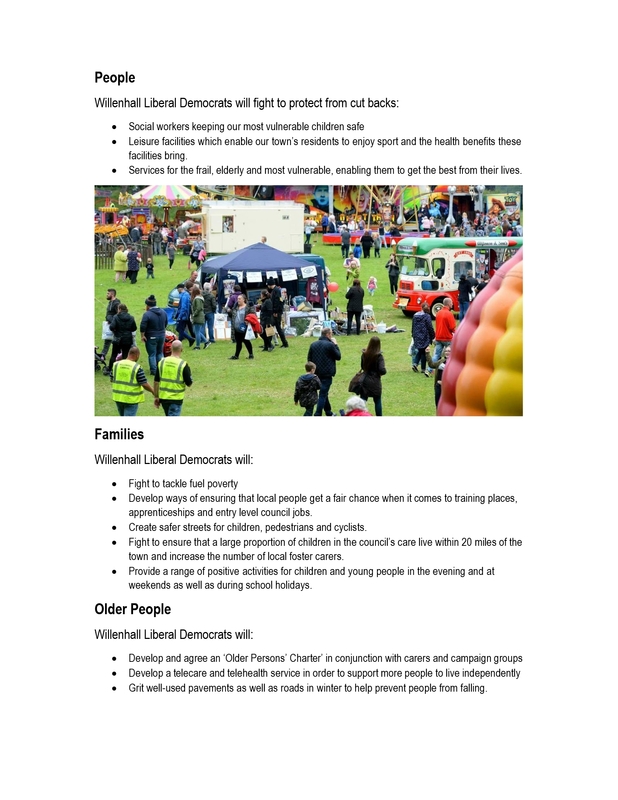 The choice will be whether under Willenhall Lib Dems, our town builds on its past successes, addresses the challenges of the future and achieves our ambitions. 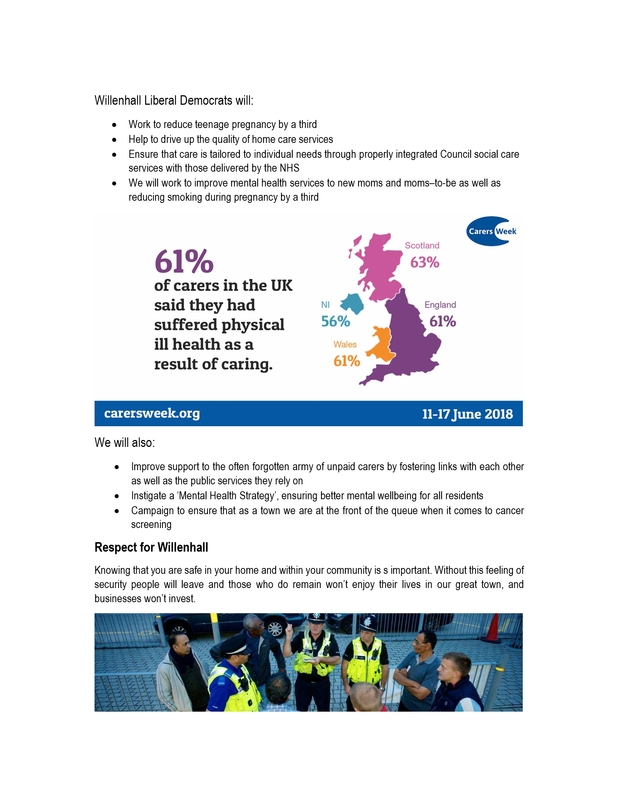 Or whether Willenhall, under the dead hand of the Conservatives at Westminster and Walsall, goes back to the spending and service delivery mentality more fitting of the great depression of the 1930’s. 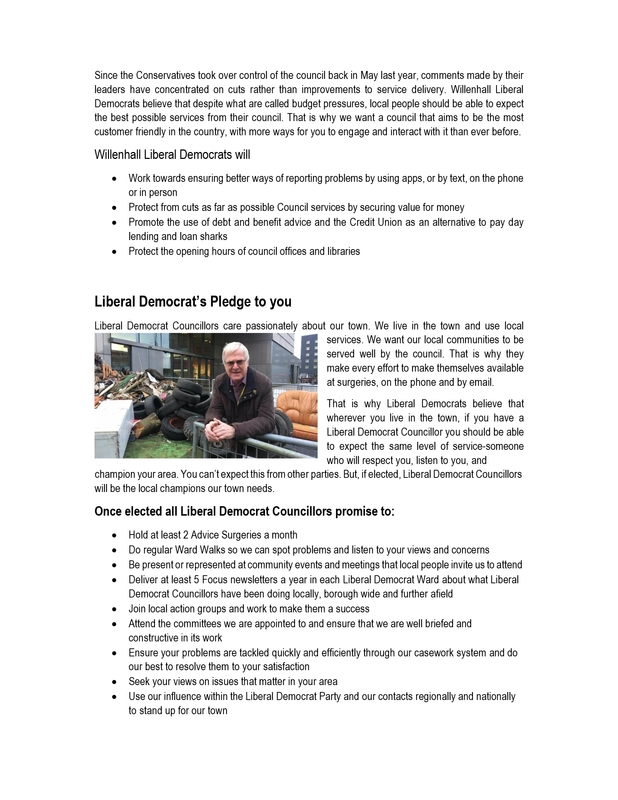 This manifesto shows that Liberal Democrats have the ambition and commitment to successfully take our town forward despite the challenges we all face. So on May 2nd please take time out to secure your future by voting Liberal Democrat in the Local Elections so together we can make our town the great place we all want it to be. 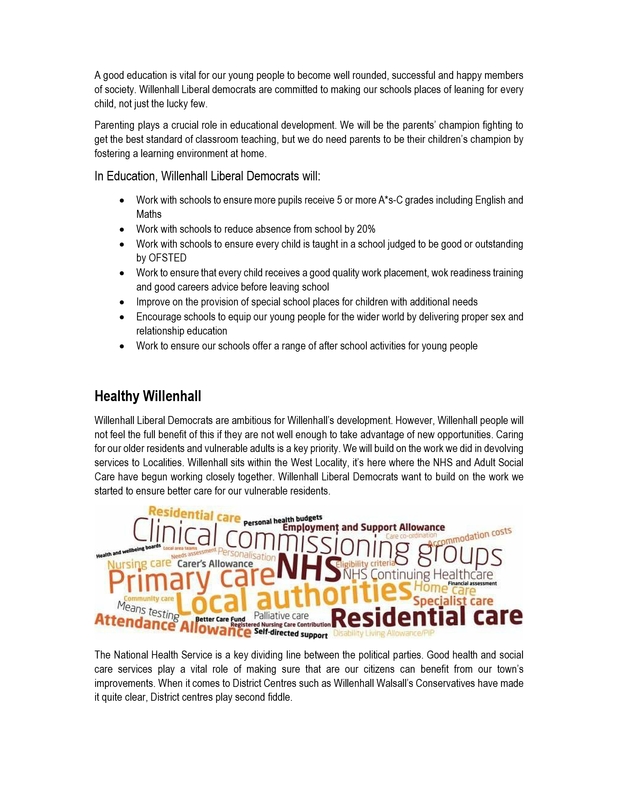 Click on the pictures below to look through our manifesto for Willenhall or download the pdf here.